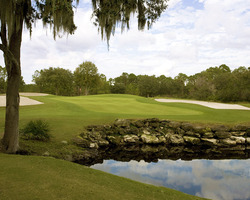 Looking for Package Deals to Florida Highlands Golf Trail? We have those too! Historic Mission Inn Resort - Golf Stay & Play $179 per person, per day! Take a look at this special Stay & Play Golf package at the historic Mission Inn Resort! Located in the rolling countryside northwest of Orlando, Mission Inn Resort & Spa is a golfers paradise of 36 holes touched by history and blessed with beauty. The Spanish-style architecture of the resort buildings creates the feeling of a Spanish oasis surrounded by hills, pristine lakes, large oaks, pines and lush landscaping. If you would like a change from the bustle of downtown Orlando area, Mission Inn Resort & Spa is the perfect place for golf purists - great accommodations, historic, parkland-style golf and relaxation just 40 minutes from Orlando International Airport! Between June 16th through August 31st, 2019 stay at Mission Inn Resort and enjoy spectacular golf on the Florida Highlands Golf Trail! El Campeon - "The Champion" originally built in 1917, one of the south's oldest courses; Golf Digest "Top 25 Resort Courses"
Las Colinas - "The Hills" is Golf Digest 4-Star rated and "Top 25 Challenging Courses in Central Florida"
$179 per person, per day - valid 7 days per week! Prices are based on double occupancy. Extra nights & otther area courses are available. Contact an Orlando Vacation Specialist for first-hand knowledge of the area & package details or to get a customized trip itinerary! 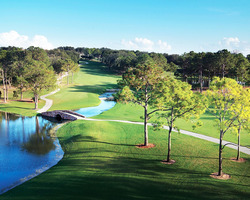 The area just northwest of Orlando known as the “Florida Highlands” is home to some of the most scenic vistas in the state of Florida - and great, natural terrain golf courses. Natural rolling hills, scenic vistas, thousands of pristine lakes and spectacular golf courses... this is the only place in Florida where golfers can experience these features. Often referred to as “Old Florida”, the area is mostly unspoiled nature, dotted with thousands of freshwater lakes including some of the largest in Florida - 17,000 acre Lake Harris, plus Lake Eustis, Lake Dora, Lake Minneola and Lake Apopka. Unfortunately, most of the golf courses in this area are overlooked by most travelers, but not anymore. Take a look at the historic Mission Inn Resort with El Campeon “The Champion” and Las Colinas “The Hills” courses onsite. 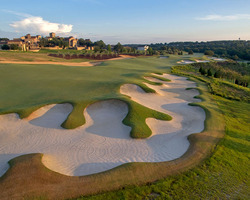 Every golf trip must include The Club at Bella Collina “Beautiful Hills”, Palisades, Sanctuary Ridge and The Legends Country Club. The Florida Highlands Golf Trail has so much to offer golfers and guests after your rounds are complete, or if you dare, an “off day” to explore the area. There are numerous festivals and events throughout the year, including The Antique Boat Festival at Mt. Dora drawing boats and collectors from all over North America, the Mt. Dora Music Festival, and the The Bassmasters Southern Open. Visitors will enjoy great “Old Florida Style” cuisine among numerous culinary choices throughout the area. If your group is looking for a change from the busy Florida tourist destinations, a golf trip to the Florida Highlands Golf Trail is a perfect choice. The area is an easy and short drive from Orlando, Tampa and Ocala. From Orlando International Airport, or Orlando-Sanford International Airport - 45 minutes, 1.5 hour drive from Tampa and 30 minutes from Ocala and Interstate 75.